Last week I participated in a webinar presented by Harlan Cohen, author of The Naked Roommate. In his presentation, Cohen reminded us that the transition to college WILL BE UNCOMFORTABLE. As counselors, parents, and teachers, we tell our students and children how lucky they are to get to go to college - that they are headed off to the best four years of their life - that they will be among people just like them - that they will have the opportunity to learn interesting material - that top-notch facilities will be at their fingertips… Our students and children know that - BUT it doesn’t change the fact that UNCOMFORTABLE can not be avoided. UNCOMFORTABLE comes with the territory of change and newness. Navigating the UNCOMFORTABLE in the college transition is an important hurdle. The skills students learn and use in this transition go into their toolkit for the future. The fact is, we are faced with uncomfortable situations throughout life. I felt the freshman uncomfortable feeling just this week when I attend the IECA (Independent Educational Consultants Association) conference in Orlando, Florida. At the happiest place on earth, amongst people whom I knew I had a lot in common with, presented with a candy shop full of information and learning opportunities, I felt uncomfortable. Business travel uncomfortable parallels college freshman uncomfortable in many ways. I entered a new and exciting environment, which I chose, but where I did not know the lay of the land or a single person. I had no safety net to turn to, no wing-man by my side, no familiar paths or comforts. I had to pull out my toolkit and manage the uncomfortable. I’m thankful that I had this experience because it reminded what my students feel when they head off for freshman year. As a counselor and parent, it's easy to forget. As I navigated the uncomfortable this week, these were some tools I used - the same tools I recommend for students transitioning into college. Feel confident in the decision you made to attend this particular school. Expect it to be uncomfortable at first and plan to step out of your comfort zone. Practice Self-care: Do what you need to maintain your personal balance. Find quiet safe places to retreat when time alone is needed. Be there to learn about what interests you. Do not feel pressure to get good grades right off the bat. Interest in soaking up as much knowledge as possible, makes grades came naturally. Before going out think about possible scenarios and have a plan... it takes time to learn who you can trust in a new environment - the one person you can truly trust is yourself. Remain in control of your decisions. Introduce yourself and make connections - other people are feeling uncomfortable too. Attend ice breakers and freshman activities. Take advantage of the programs offered to acclimate. Know yourself - Be yourself - Expect the Unexpected - Be Patient - Remember, it WILL be UNCOMFORTABLE at first. As a follow-up to this article, the IECA Conference was a huge success. I learned a lot and made great new friends. I will be sharing my new knowledge with you in future posts. Print out your admission ticket and read it over. Gather everything you need to bring to the test center. Get directions to the test center. Plan a test-drive to the test center if you are not familiar with the area. Decide what time you will need to leave your house in order to arrive at the test center a few minutes early. Plan what you will wear to the exam and lay it out. Pick something comfortable. Plan your breakfast for test day and be sure you have the ingredients available. Reviewing the big picture format and timing of the test. Gather any test items that you were not able to find yesterday. Make sure there is enough gas in your car. Relax - Remind yourself that you ARE prepared for the test. Focus on how much you DO know. Do NOT think about areas you feel you need work on. Do NOT take extra practice tests. If negative thoughts slip into your mind, delete them immediately. Tell yourself you are prepared. Do NOT try to cram in information. Go to the movies or do something that takes your mind off of the test. How will I know if the test center is open? What if it is open but I can’t get there? What if the test center is not open on my scheduled date? When and where will I make up the test? Don’t worry. Colleges do not see that you registered for but missed the test day. Obviously, is best to take the test when you are healthy. If you are unsure of what to do, is worth a call (319.337.1270) to ACT to explain your situation and discuss your options. If any other questions come up, go to the testing source, ACT.org. A relaxed brain performs. In order to earn your optimal score, take ACT in a comfortable, relaxed and confident state of mind. Wishing you all the very best on test day. 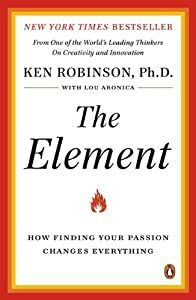 Sir Ken Robinson has had a place on my list of favorites since I was introduced to his book, The Element, in 2009. Every time I read, watch or listen to Sir Ken Robinson I feel inspired and optimistic. I agree with Sir Ken Robinson's belief that education is about finding each person's passion. Education is not a cookie cutter process because humans are not cookie cutter creations. We are each uniquely created and influenced by our environment and our peers. An educational environment that is best for one student is not best for another. Successfully educating students requires knowledge, creativity, and commitment to each unique child. A student must be in a relaxed environment to learn and create. A relaxed and inspired brain learns. In the past, within hours of reading, seeing or hearing Sir Ken Robinson's work, my bubble of optimism began to deflate. I would realize that the changes needed to improve education were too vast. Vast change takes time and we have a generation that can't wait. My desire to do something now led to EdNavigators . Through EdNavigators, I help students, on an individual basis, to discover their passions, navigate their educational paths, overcome roadblocks**, and move toward their dreams. Sir Ken Robinson will be speaking at Malvern Preparatory School on Tuesday, October 1 at 6:30PM. Kudos to Malvern Prep for hosting this forward thinker and popular presenter! I encourage everyone who is able, to see Sir Ken Robinson at Malvern Prep. This is the link to purchase tickets. A Relaxed Brain Learns. A Relaxed Brain Functions. A relaxed brain learns. A relaxed brain functions. Worry, fear and panic freeze the brain. Students need to learn how to relax their brain. A relaxed brain during a test is able to think and process the questions. A brain in panic freezes. Students need to learn how to turn off the negative thinking that sneaks in and leads to panic. They need to learn how to relax their brain. What method works for you? Once you figure it out, incorporate it into your testing strategy. Give yourself enough time to spare before the test so that you can prepare yourself to take the test with a relaxed brain.